Where is the best tourist sites if you are in Hong Kong? As a recommendation once the mainstay of Hong Kong City is the establishment of a peak called The Peak Tower in Hong Kong. The Peak is one of the most popular attractions in Hong Kong with 6 million people visit it each year. Things that attract tourists to The Peak is a beautiful landscape includes Hong Kong Island and Kowloon Peninsula. This location also is home to the elite. 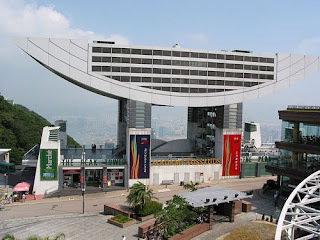 Victoria Peak, another name of The Peak (Victoria Peak) is a mountain in the southwestern part of Hong Kong with a height of 552 meters and the highest on the island of Hong Kong. 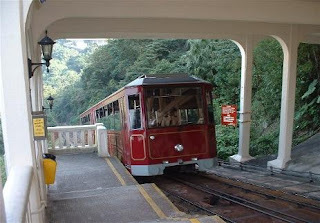 To achieve the most beautiful location, you can reach through the usual way and the Peak Tram, a train Funikular. If using the tram, passengers can see the sights of Hong Kong Island on the one hand while using the road, can see all parts of Hong Kong. Peak Tower is a tower on Victoria Peak is also a stop at the top of the Peak Tram. Designers wanted a design that clearly draw attention but do not interfere with the scenery around. Architect Terry Farrell designed the tower is a form of pan (a half circle with straight sides at the top) and has 7 floors with a total area of ​​10.400 m².